Overnight pumpernickel bread is super easy to make and actually quite healthy! The caraway seeds give this rustic loaf a wonderful aroma. Although this loaf isn’t made from a sourdough starter, it still has a wonderful flavor. The molasses and cocoa powder give it a dark color, and the caraway seeds give it a delicious flavor. Using rye flour changes a bread significantly! You’ll notice that it feels much different when mixing and kneading. The dough will be grainy from the coarse-ground rye and won’t feel smooth and elastic like a white bread dough. Most noticeably, it takes much longer to rise than a traditional white bread loaf,because of its heavier flour. Rye is also gluten-free, so this loaf will not rise as high as a white loaf, even with the addition of some white bread flour. The unique flavor and aroma of this dough is unbeatable, though! Give this loaf a try! It requires only a little prep time, and tastes delicious! 😋 This bread is particularly nice in our toasted stars, which make a great appetizer or garnish for soup. Place the rye and bread flours in a large mixing bowl. Add the salt and yeast on opposite sides of the bowl, stirring in each one with a finger. Sift in the cocoa powder and dump in the caraway seeds. Stir everything together until mixed. Add the molasses and about half of the water. Start mixing the dough by hand, gradually adding more water until all the flour is picked up and a soft, slightly sticky dough is formed. You may not need all of the water, depending upon the flours you are using. Turn out the dough onto a work surface lightly dusted with rye flour. Knead for about 5-10 minutes until the dough is smooth and no longer so sticky. Since rye flour contains no gluten, the dough will not be elastic like a traditional white bread. Shape into a lovely ball, place in a lightly oiled bowl, cover tightly with plastic wrap, and let the dough prove in the fridge overnight, or at least 8 hours. The dough will not quite double in size. Take the dough out of the fridge and place it in an unheated oven. Put a metal pan of boiling water in the oven to create steam and warm the dough. Let it rest in the steamy oven for about 3 1/2 hours, changing out the water as needed. Flour a large round baking stone with rye flour or line a cookie sheet with parchment paper. Once the dough has proved for 3 1/2 hours, gently turn it out onto the prepared baking stone, taking great care not to knock out the gas trapped in the dough. Gently rub some rye flour onto the top of the loaf and cover with plastic wrap. Let the loaf prove in the steamy oven for about 15 minutes. Remove the loaf and the pan of water from the oven and let it prove for another 15 minutes on the countertop. While the loaf is proving, preheat the oven to 425 F. Empty the metal pan and put it on the lowest rack of the oven to preheat. Once the oven has preheated, check the loaf. If it hasn’t cracked on top, score the loaf in a diamond pattern with a sharp knife. Place the loaf in the oven. Working quickly, pour some water into the preheated metal to create steam, and immediately shut the oven door. Bake at 425 F for 30 minutes, then lower the temperature to 350 F and bake for another 30 minutes. The loaf is done when it is crusty and has an internal temperature of 200 F.
Let the loaf cool for 1-2 hours before serving. To serve, slice thinly and spread with butter. 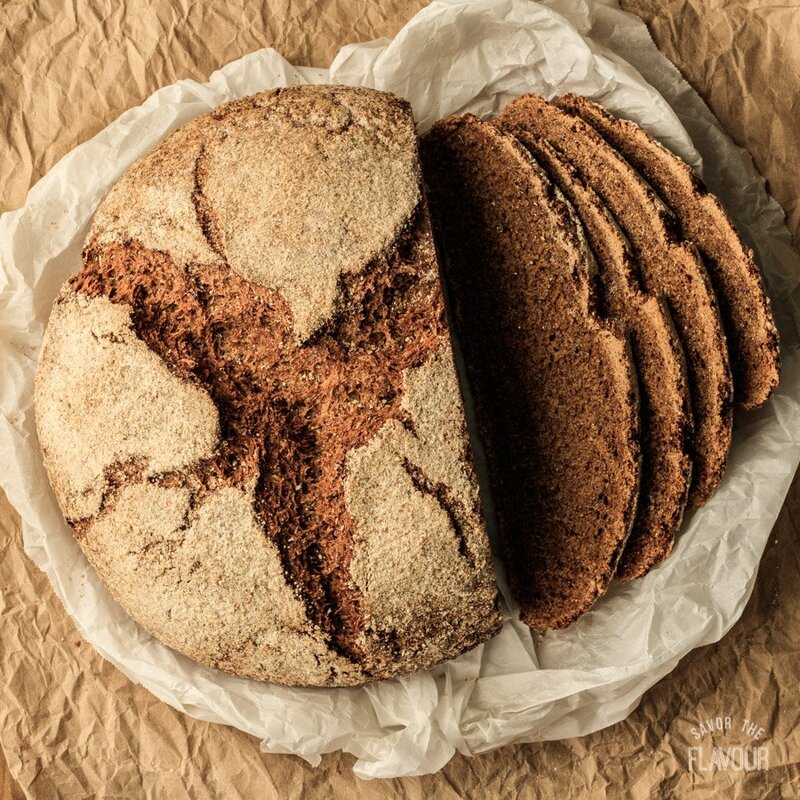 Whole-grain rye flour is also called pumpernickel flour. If you’re looking for a delicious gourmet appetizer, serve this bread topped with dijon mustard, raw red onions, and a small piece of Limburger cheese.